After being a florist for more than 30 years — and gardening for the majority of her life — it is no wonder that Donna Covais can design beautiful gardens, wreaths and floral arrangements. What separates her from the crowd is that she lost her vision 18 years ago. Frank Oliver, senior product developer at Gardener’s Supply, reached out to Donna in 2001. Without taking no for an answer, he encouraged her to start gardening again. 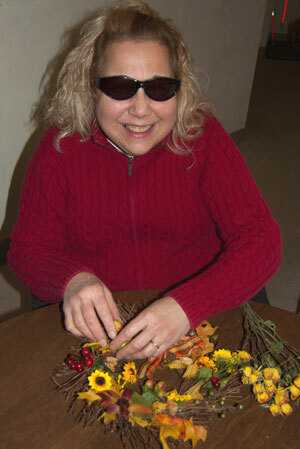 “Donna can feel a plant and identify it better than I can do it with sight,” Frank says. When I first met Donna, I accompanied her and a group of Vermont Master Gardeners to one of her weekly visits to the Visiting Nurse Association in South Burlington, VT, where she meets with a group of adults suffering from Alzheimer’s disease and dementia. 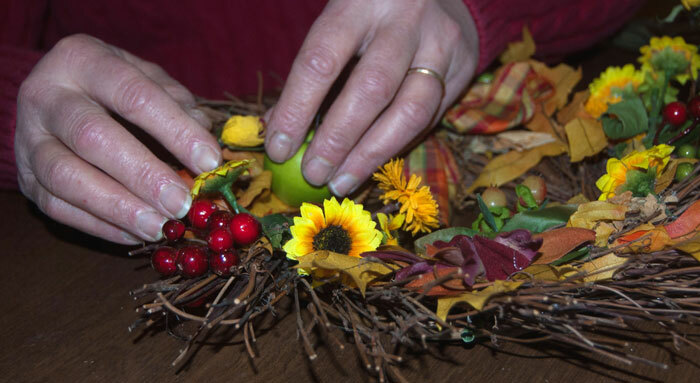 Using a variety of dried herbs and flowers, Donna led the group step-by-step, working on her own wreath. When she asked me to hand her the dried mint, I was hesitant because it looked shriveled up. Despite my objections, she insisted that I hand it over. As she felt the dried mint sprigs, a smile swept across her face. “These are just beautiful. They will be perfect right here!” Donna felt the mint, seeing beyond the flaws that I saw, and found a way to work it into her wreath. Her ability to find the beauty in unseen flowers and people is what makes Donna Covais such an inspiration. She doesn’t let blindness hold her back. In addition to the weekly visits, she hosts an event for 6th graders, and has become a registered horticultural therapist. Donna’s next project is to organize the American Horticultural Therapy Association (AHTA) National Conference to be held in Burlington, VT, in 2017. The time I have spent with Donna has changed the way I appreciate gardening and the power it has to bring joy and peace, no matter who you are. Avery Harris is an intern at Gardener’s Supply.